The warning systems switch is used to turn on and off the warning systems (Lane Departure Warning (LDW), Forward Collision Warning (FCW) and Blind SpotWarning (BSW) systems) that are activated using the settings menu on the vehicle information display. When the warning systems switch is turned off, the indicator 1 on the switch is off. The indicator will also be off if all of the warning systems are deactivated using the settings menu. The LDW system will sound a warning chime and blink the LDW indicator light (orange) to alert the driver if the vehicle is traveling close to either the left or the right of a traveling lane with detectable lane markers. For additional information, refer to “Lane Departure Warning (LDW) system” in the “Starting and driving” section of this manual. 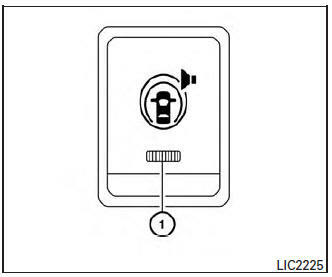 The BSW system will turn on the BSW indicator light, located next to the outside mirrors, if the camera detects a vehicle in the detection zone. If the turn signal is activated in the direction of the detected vehicle, a chime sounds twice and the BSW indicator light will flash. For additional information, refer to “Blind Spot Warning (BSW) system” in the “Starting and driving” section of this manual.